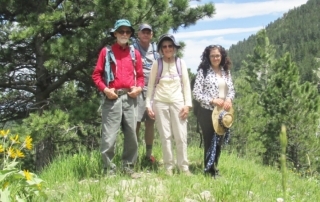 Our group took on Little Goose Canyon road (aka County Road 77) on May 31, 2018, with perfect weather – sunny, warm, a slight breeze, and no bugs. 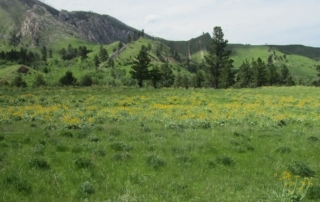 The two-track road crosses Little Goose Creek, then after a short, steep climb, ascends gradually as far as you’d like to walk among sloping prairie and panoramic views of the Bighorns that reveal hogback ridges and dipping rocks of the Bighorn Dolomite that form the flanks along the mountains. 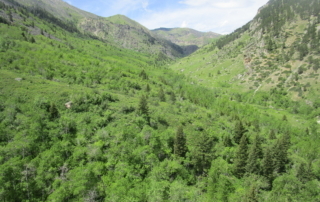 We had the option to go as far as we wished, maybe to the Colorado Ditch crossing, maybe to the gate to the cabin, or all the way to the end of the road after a bit of a boulder ascent – and we made it to the end! 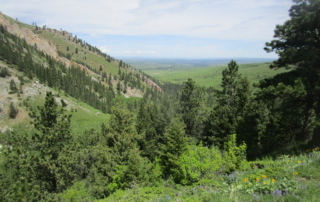 A short climb up to the top of a little knoll revealed a spectacular lunch-time view up Little Goose Canyon, with views along Moncrief Ridge and down into the valley toward Sheridan. Wild flowers abounded, and thanks to Bob Giurgevich, a vegetation expert, we were able to identify several species of plants. 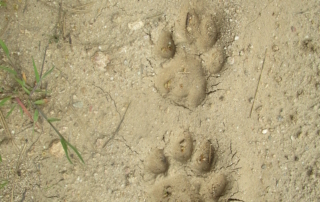 We also saw mountain lion tracks and elk sign, and spotted hawks hovering above. Bob even found some ripple marks in the old Flathead Sandstone at the top of the knoll, and, based on their symmetry, indicate that this was probably a beach some 500 million years ago! 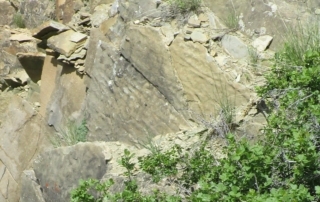 These rocks are tilted up vertically on-end, indicating some major geologic forces were in effect when Moncrief Ridge was thrust out into the basin along a fault under the Bighorn Mountains. We’ll keep this hike in mind for the future!